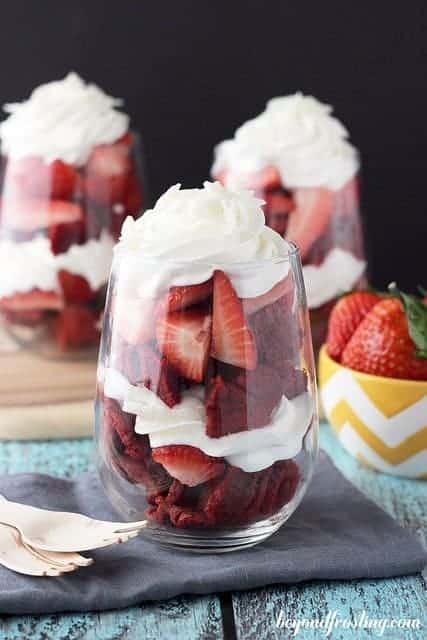 These No-Bake Red Velvet Cheesecake Shooters give you all your favorite parts of Red Velvet Cake but packed into a parfait. Okay be honest with me, are you a fan of red velvet or not? I find people either love it or hate it. Personally, I have to be in the mood for it and it has to be the RIGHT red velvet flavor. I can’t even tell you how many times I tasted a cupcake that is neither chocolate or vanilla. I feel like I must not be the only one right? 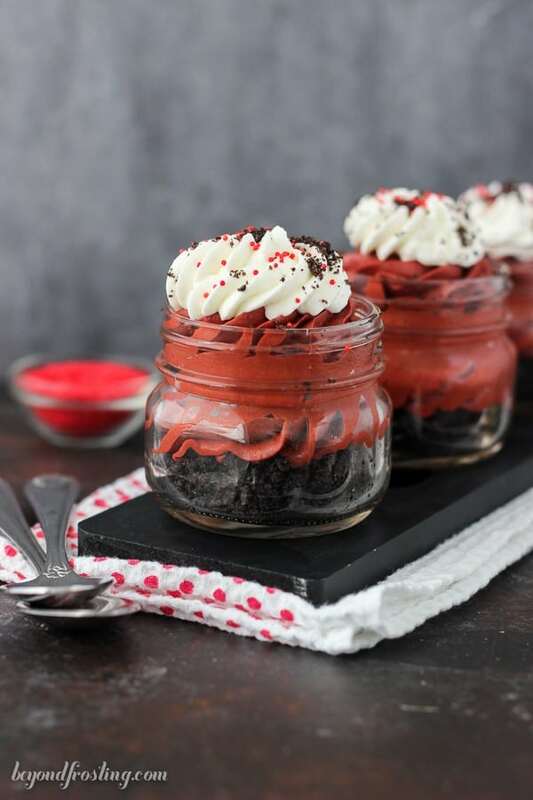 These Red Velvet Cheesecake Shooters have just the right amount of chocolate flavor. On the bottom, you’ve got a nice thick layer of Oreo cookies. 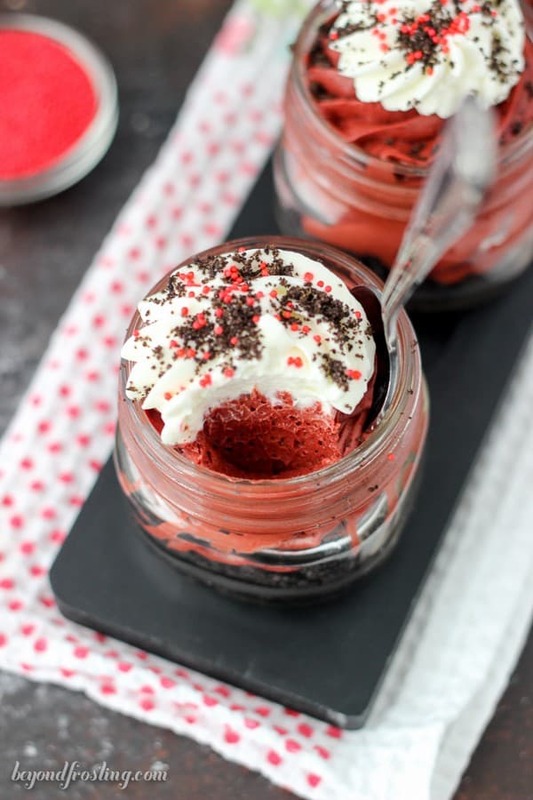 Next, you have a smooth, red velvet no-bake cheesecake filling and it’s topped with a dollop of whipped cream. The red velvet cheesecake is very simple, and it requires no baking; which is always a win in my book. It’s a mixture of cream cheese, melted chocolate and whipped cream. Easy right? You could always substitute Cool Whip instead of whipped cream, that’s your choice. Often times people complain that they don’t like the taste of red food coloring. Thankfully, my friends over at Wilton make a No Taste Red Icing Gel . The gel like consistency is thicker, so you need of it to get that dark red color without sacrificing the flavor. You can find it at your local craft store (in the baking section) or purchase online. I mixed the red dye into the cheesecake before adding the whipped cream, because the gel needs to be aggressively mixed into the filling and you don’t want to deflate the whipped cream in the process. The filling is pretty soft when you finish mixing it all together, so I do suggest to refrigerate it for at least one hour if you want to use a piping bag to make that pretty swirl in the parfait. However, if you want to spoon it directly into your parfait cups and refrigerate, that is fine to. If you do refrigerate this overnight, the cheesecake will be firm, so I suggest to allow it to sit at room temperature for at least 20 minutes before serving. I don’t care what anyone says, there is nothing cutier than a mini dessert. Single serving desserts don’t leave any guessing to the question, “can I have a bite”? No, no you can’t. See this SINGLE serving over here? Yep, it’s all mine. Plus if you want to go for seconds, you don’t have to feel guilty about that. 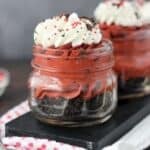 This dessert will make 4 large or 6 small parfaits depending on the size you make. If you are looking for a Valentine’s Day Cake to serve a crowd, I suggest maybe trying this Valentine’s Day Ombre Heart Cake or my Chocolate Covered Strawberry Cookies. In a microwave-proof bowl, place dark chocolate chips and 3 tablespoons heavy cream. Heat in the microwave for 60 seconds. Remove an immediately whisk until smooth. Allow to sit for 10-15 minutes until cool or refrigerate to cool off. Place mixing bowl and wire whisk attachment in the freezer for 5-10 minutes until bowl is cold. Pour 1 1/2 cups heavy whipping cream into chilled bow. Beat heavy whipping cream on medium-high speed for 2 minutes until cream becomes bubbly. Slowly add powdered sugar and increase speed to high and beat until stiff peaks form (3-5 minutes). Measure out ¾ cup of whipped cream for the topping. Set remaining aside. In a separate mixing bowl, beat cream cheese on medium-high speed until light and fluffy, about 3-4 minutes. Next, add melted chocolate mixture and beat until mixture is smooth. 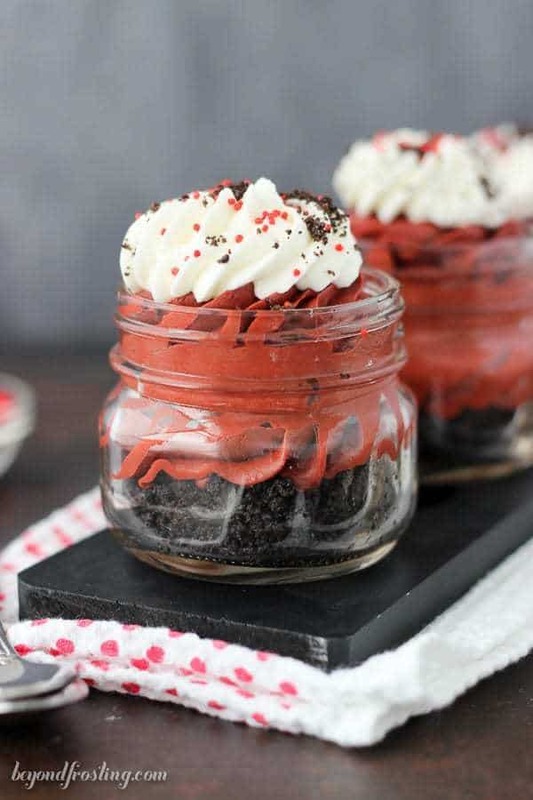 Add no-taste red food coloring gel about 1 teaspoon at a time, and fold into mixture until desired red color is reach. I would suggest a darker red as opposed to a nice bright red. This requires less food coloring. Gently fold prepared whipped cream (all but ¾ cup) into the cream cheese mixture. Refrigerate cheesecake for about one hour until slightly firm. Use a food processor to grind up Oreos into a fine crumb. In a microwave-safe bowl, melt butter for about 30 seconds. Combine melted butter with Oreo cookie crumbs and mix thoroughly. Assemble your parfaits by adding two tablespoons of the Oreo crumbs into the bottom of your parfaits. 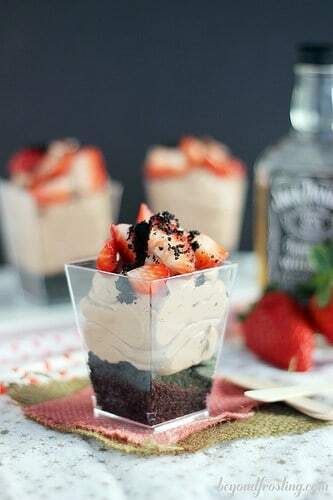 Follow with about ¼ cup of the chocolate filling and top with remaining prepared whipped cream right before serving. 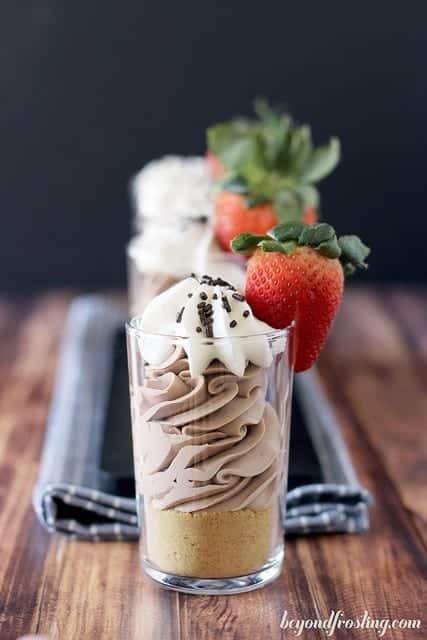 The filling is pretty soft when you finish mixing it all together, so I do suggest to refrigerate it for at least one hour if you want to use a piping bag to make that pretty swirl in the parfait. However, if you want to spoon it directly into your parfait cups and refrigerate, that is fine to. If you do refrigerate this overnight, the cheesecake will be firm, so I suggest to allow it to sit at room temperature for at least 20-30 minutes before serving. And the whipped cream right before serving. Would it make a big difference if I used nutri whip? These shooters look amazing and sound delicious! I’ll have to make these this weekend. These are so pretty. Love that you piped it in the little jars. Beat heavy whipping cream on medium-high heat for 2 minutes until cream becomes bubbly. Ummm………can I assume that you didn’t mean to say medium-high HEAT? I have to admit that I’m not a huge red velvet fan, but these are so pretty that I would dive right into one without another thought! 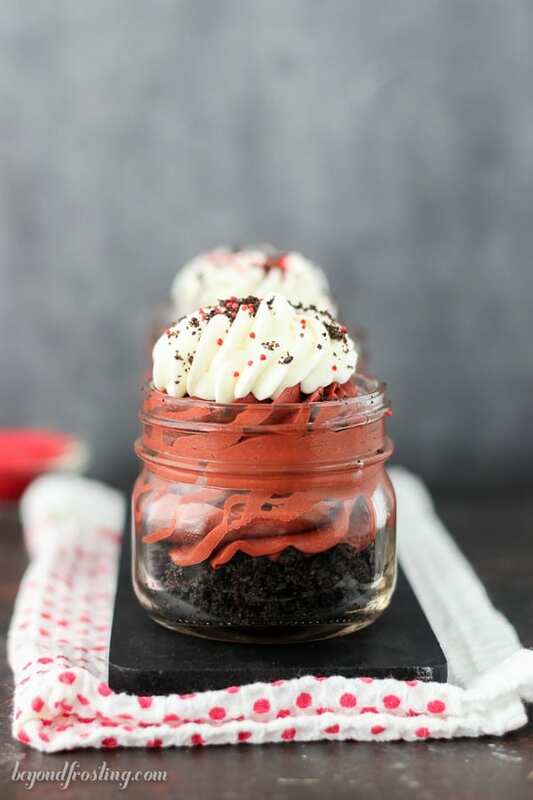 I can’t resist mini desserts and these cheesecake shooters are so much fun! Who can resist red velvet? I want to dig my spoon right into them. I love how red you were able to get this with that food coloring. I totally need to order some this week.